A round-up of fast dinner ideas that are all 30-Minute Meals. This list of easy dinner ideas includes healthy, chicken, ground beef, low carb, kid dinners, and more. Nothing beats dinner that you can throw together in just thirty minutes! This time of year can be incredibly busy and most people would do anything for a little extra time in the day. Thankfully, I have compiled some of my favorite 30 minute meals to take the pressure off preparing a fancy dinner! These fast dinners ideas include chicken dinners, beef, pasta, kid dinners, healthy dinners, and more. Check out ALL of my 30 minute meals! 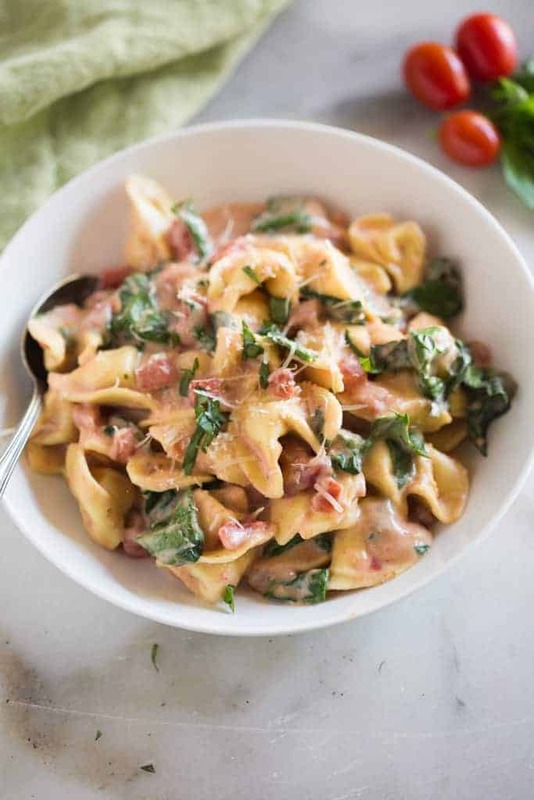 This Creamy Tomato and Spinach Tortellini pasta is perfect for a quick and easy weeknight meal. The recipe includes cheese tortellini in a creamy homemade pink sauce with spinach, basil, and fresh parmesan cheese. Healthy food has never tasted so AMAZING! These Thai chicken lettuce wraps are bursting with bold flavor, and fresh ingredients. They can be enjoyed as a main dish or served as an appetizer. 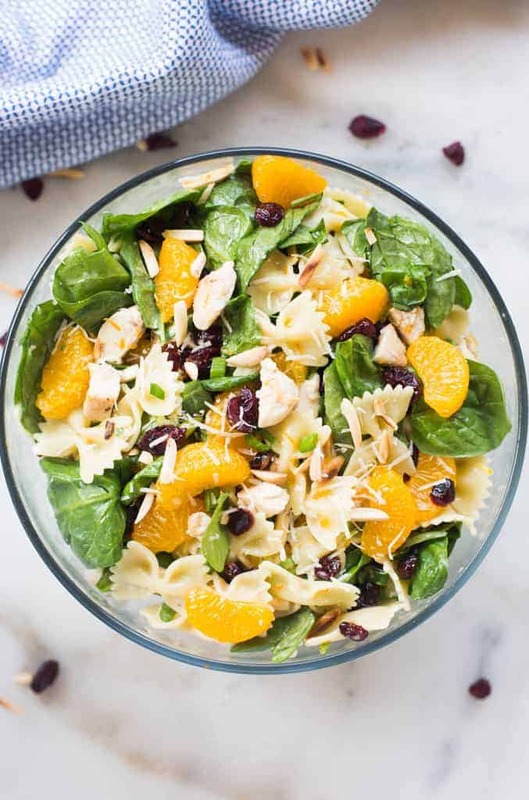 Thick of your favorite caesar salad, add some pasta, and you have a filling and delicious dinner! 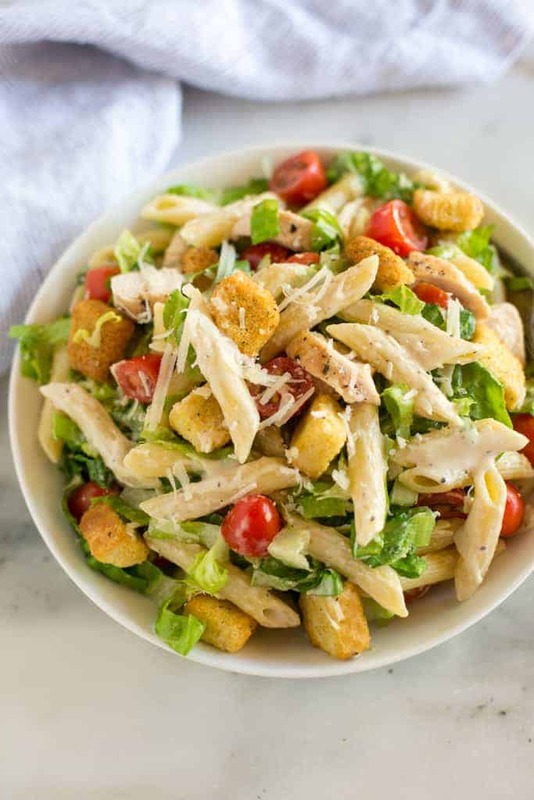 This Chicken Caesar Pasta Salad is loaded with croutons, parmesan cheese, lettuce, tomatoes, pasta and grilled chicken, all smothered in a creamy caesar dressing. 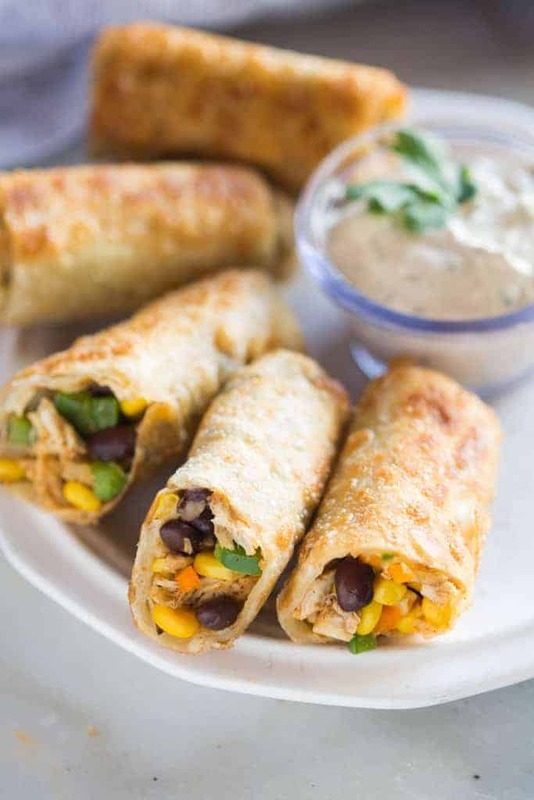 Crispy Bean and Cheese Burritos are guaranteed to be family approved, and perfect for an easy weeknight dinner. 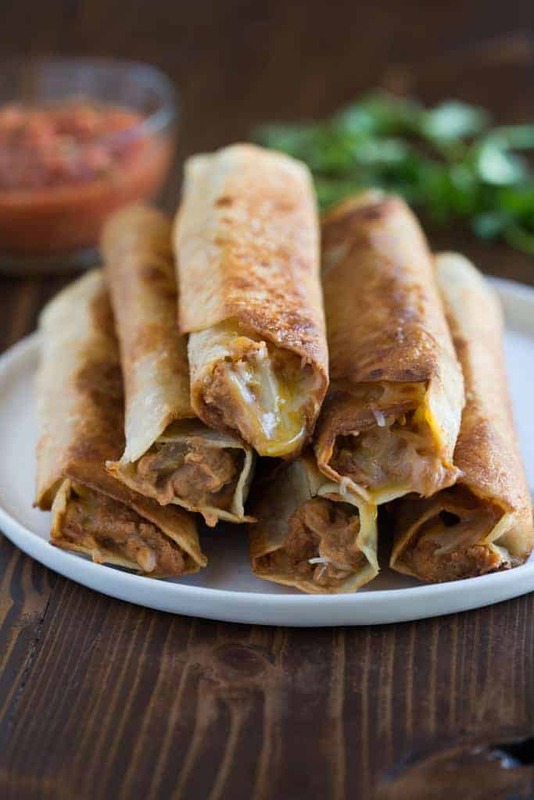 They’re freezer friendly and vegetarian, with seasoned refried beans and fresh shredded cheese layered inside a tortilla and cooked until crispy. 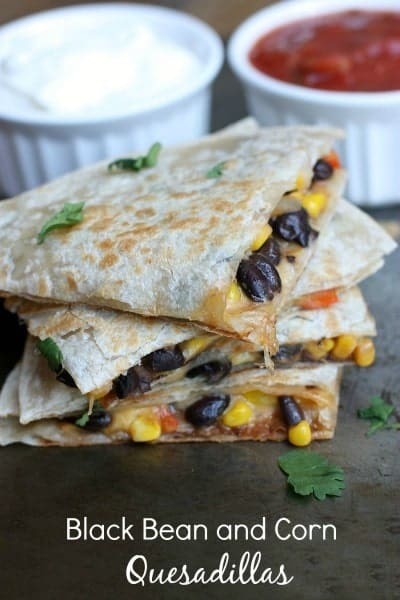 We’ve upped our quesadilla game with these flavorful and simple Black Bean and Corn Quesadillas. Flour tortillas are filled with cheese and a mixture of black beans, corn, onion, and bell pepper. 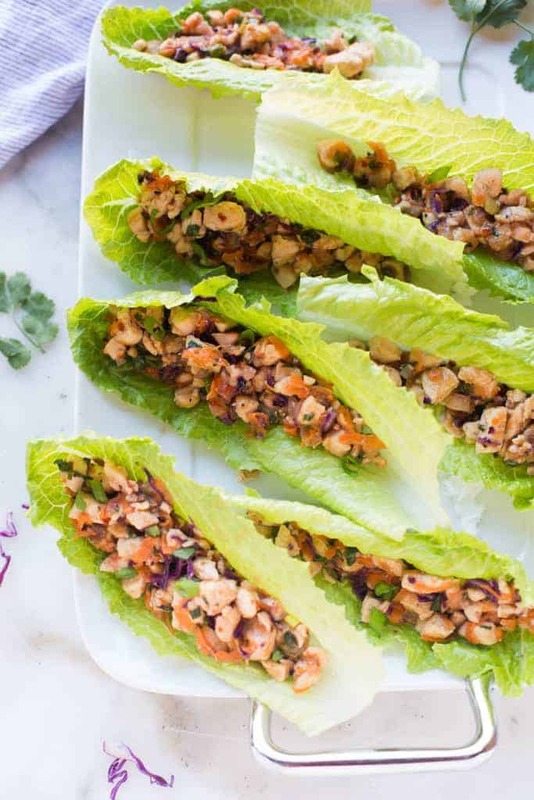 We enjoy these Healthy Asian Lettuce Wraps as a main dish, served with potstickers, fried rice, or a side of fresh fruit. 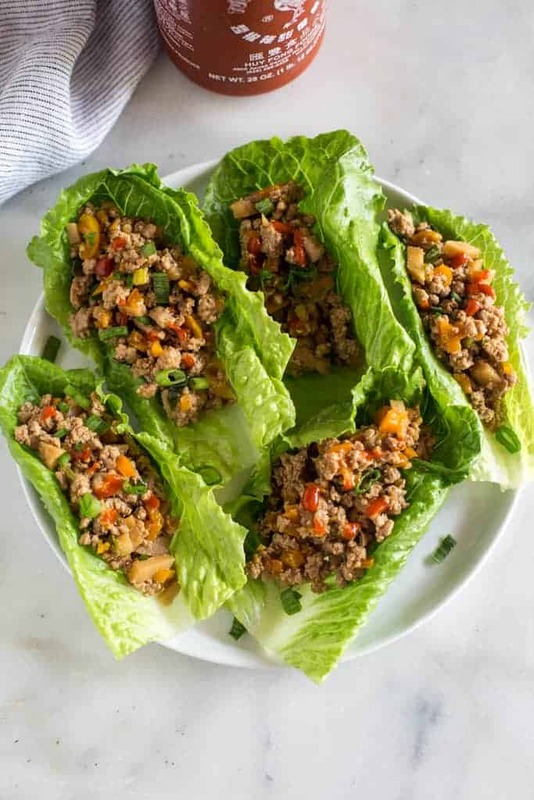 They’re made with ground chicken or turkey, fresh chopped vegetables and a delicious stir-fry sauce, served in a cold and crisp lettuce leaf. We’ve declared these the BEST homemade Cheese Enchiladas, and if you try them, I think you’ll agree! 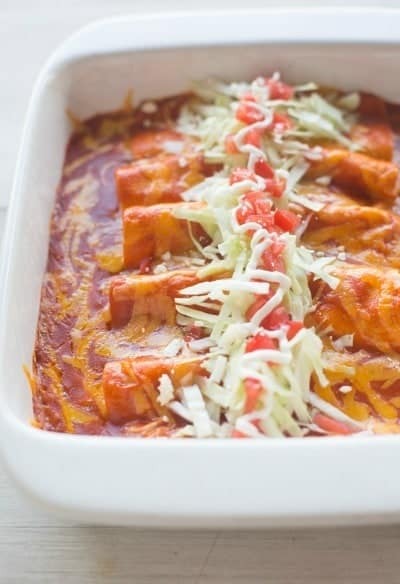 Our favorite authentic cheese enchiladas are easy, fast and insanely delicious! 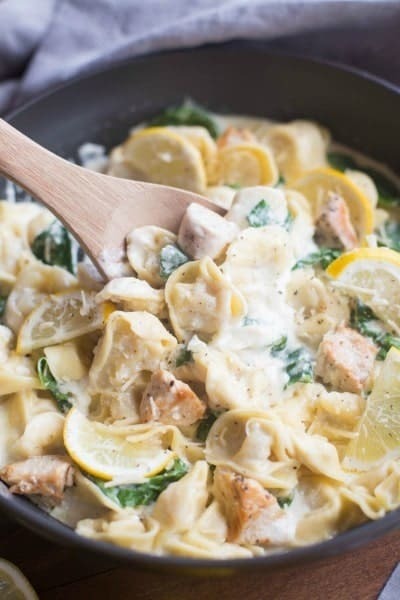 This delicious One Pan Creamy Lemon Chicken Tortellini is an easy one pan pasta dish that the entire family will love. Tortellini pasta with grilled chicken and fresh spinach in a warm, cheesy lemon garlic sauce. 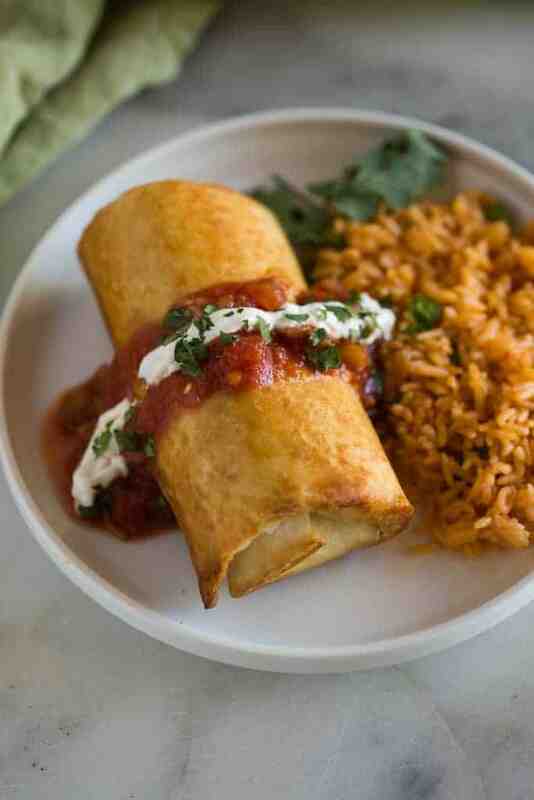 Chicken Chimichangas is one of few recipes that makes it onto our regular dinner rotation. They are delicious and so easy to make! We serve them topped with sour cream, guacamole and salsa, with a side of Mexican rice. 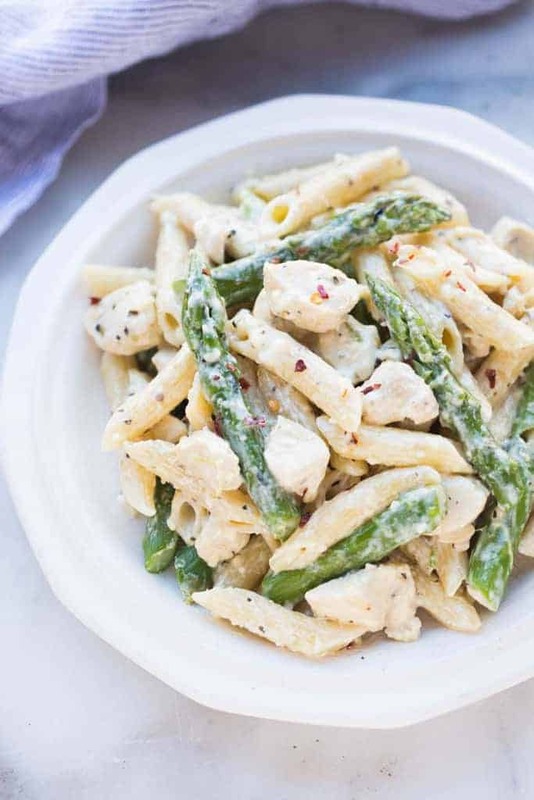 My family loves this easy Creamy Chicken and Asparagus Pasta dish made with penne noodles, chicken and asparagus tossed in a creamy parmesan sauce. 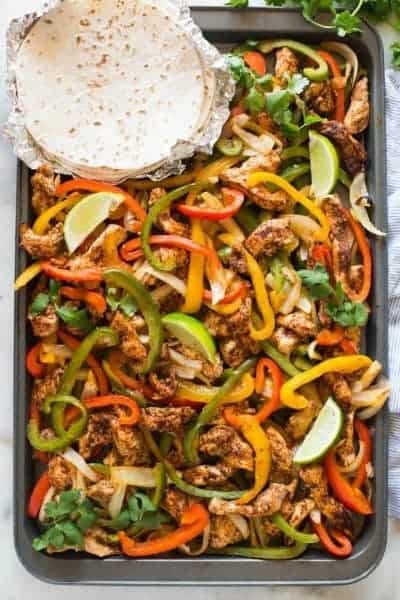 Tuesday taco nights have never been easier and tastier thanks to these Sheet Pan Chicken Fajitas! This is such a simple one-pan dinner that includes seasoned chicken and vegetables served in warm flour tortillas with your favorite toppings. We all need a few quick, easy, and inexpensive dinner ideas in our arsenal that our family is guaranteed to eat happily, right? 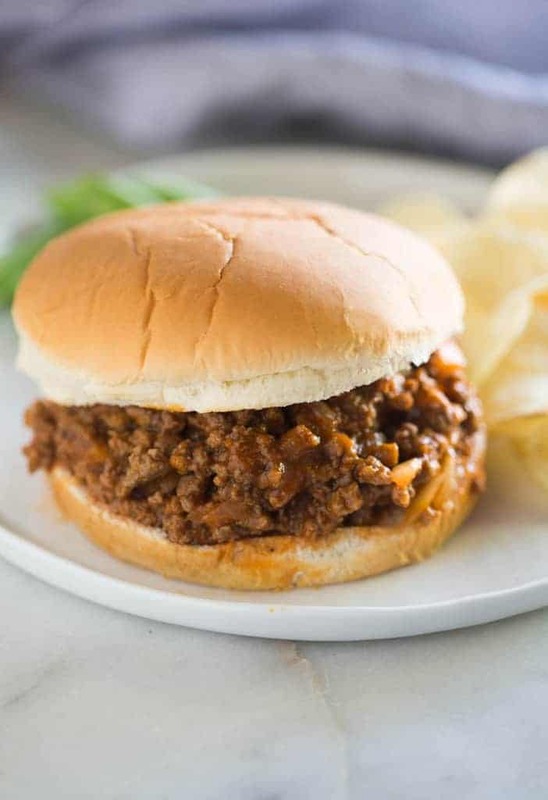 This classic Sloppy Joes recipe fits the bill in every way: simple, quick to make, and a family favorite. 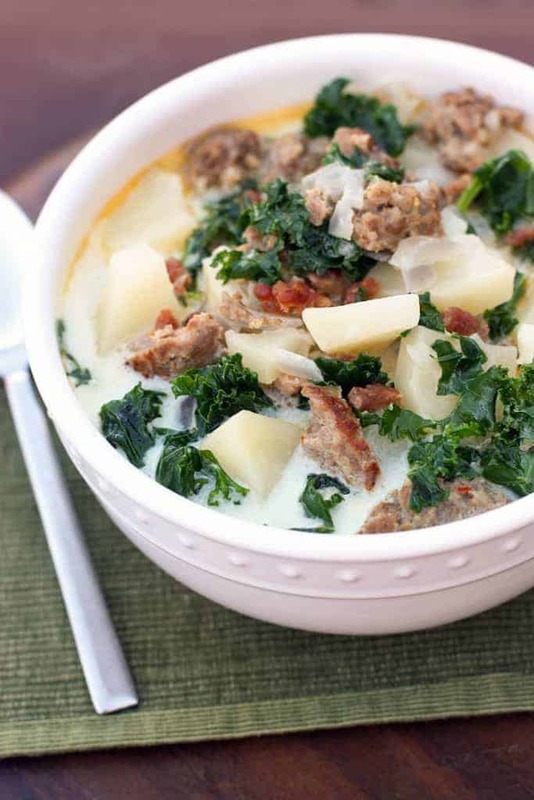 Everyone loves this creamy Italian soup with sausage, potatoes, chopped kale and bacon. It’s easy to make and so comforting on a cool night. 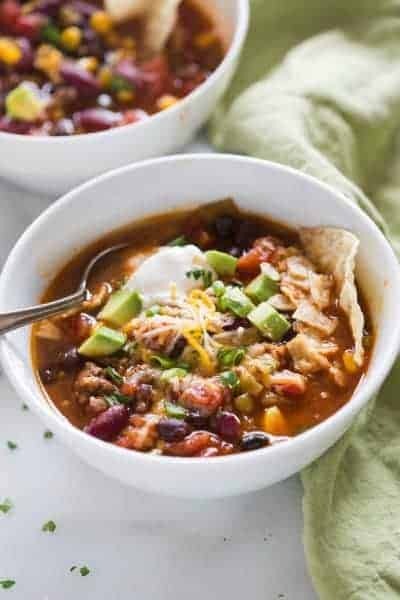 This easy Taco Soup recipe is one of my favorite dinner solutions when I want something healthy, quick, and tasty. And it’s a slow cooker or stove top recipe that my family will LOVE! 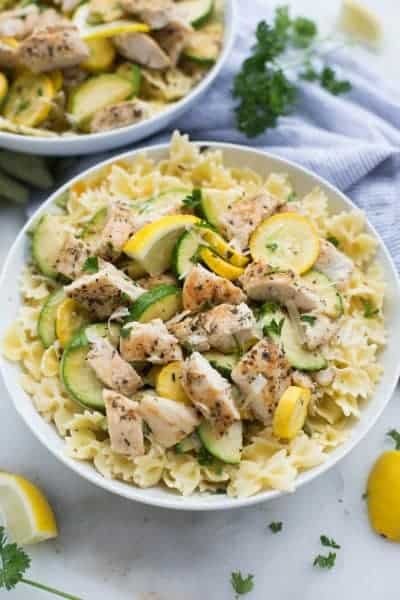 Lemon Parmesan Chicken Pasta is delicious seasoned and sautéed chicken and summer veggies, parmesan, lemon and pasta. 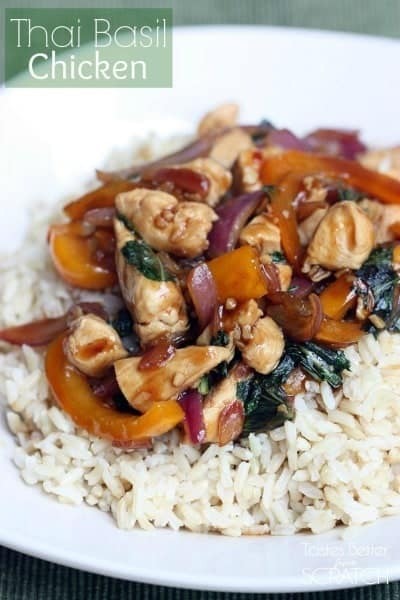 The perfect easy, flavorful, 20-minute meal. Turn these delicious crepes into a savory dinner your family will love! 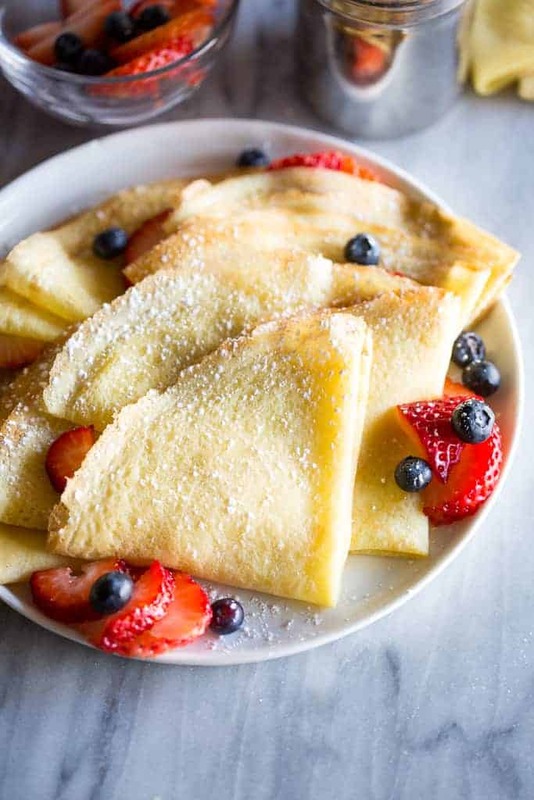 This recipe offers a step-by-step guide for How to Make Crepes in a skillet or frying pan, along with filling options for sweet, savory, and breakfast crepes. Crispy Southwest Egg Rolls (that you can bake or fry!) served with a creamy cilantro dipping sauce. Serve them with a side of rice and fruit for a complete meal! Of all of the homemade Italian recipes I make, this Tuscan Garlic Chicken is a definite family favorite! 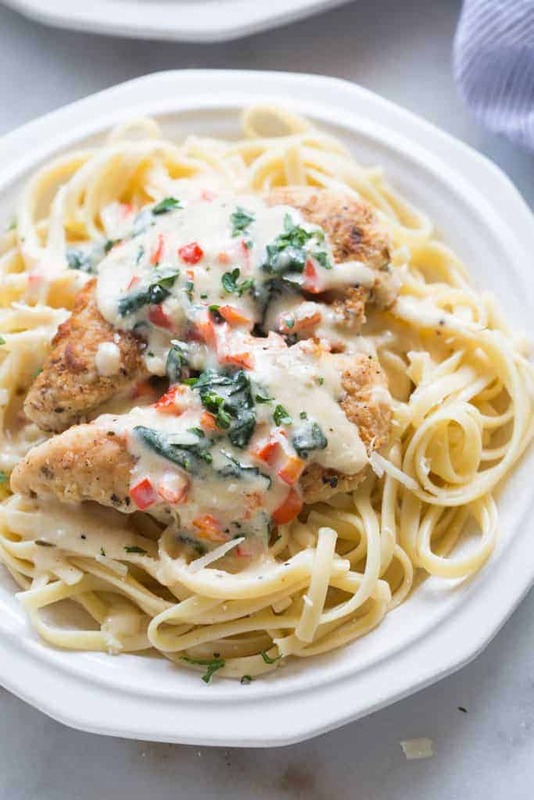 Tender and juicy crusted chicken served over noodles with a delicious creamy tuscan garlic sauce. 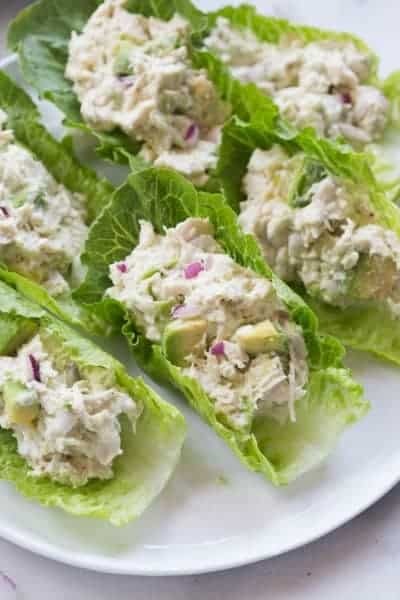 If you love chicken salad and avocados you will go crazy for these Avocado Chicken Salad Wraps. They make a healthy and delicious dinner and you cans serve them with a big side of fresh fruit to make a complete meal. 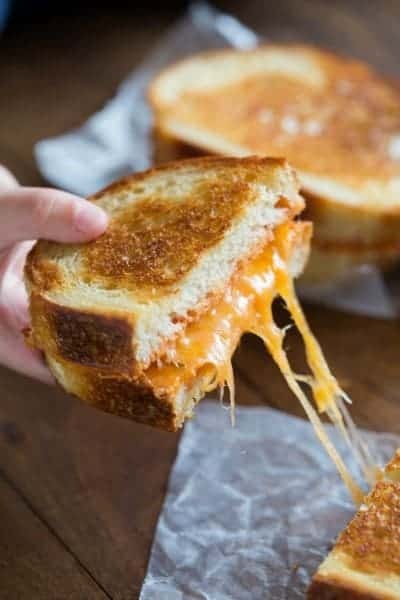 Italian Grilled Cheese Sandwiches is my favorite twist to a traditional grilled cheese! 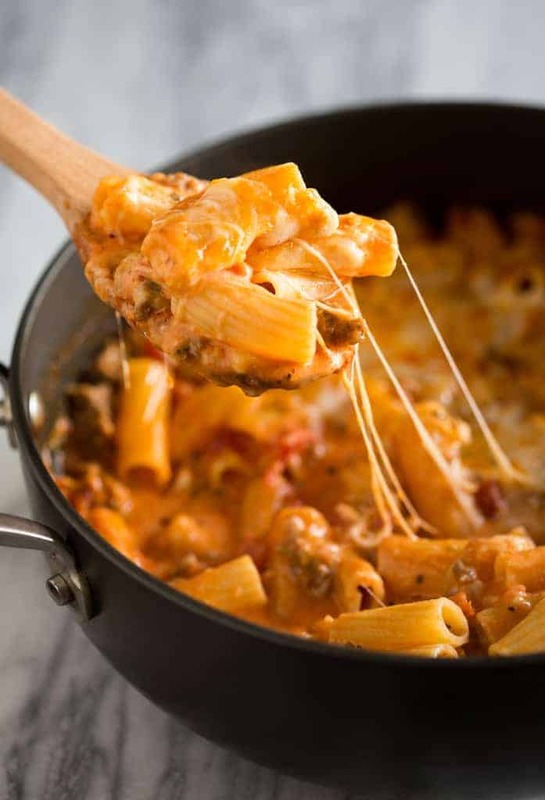 Any dinner that’s ready in 15 minutes is my kind of easy weeknight meal! Chicken Bacon Avocado Wrap is one of my favorite easy dinner ideas! 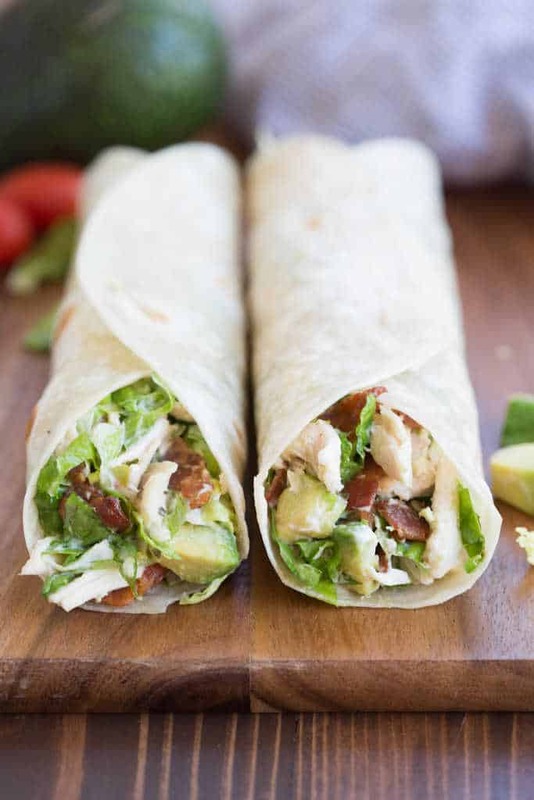 Lettuce, chicken, bacon and avocados tossed in a yummy dressing and layered inside a tortilla. 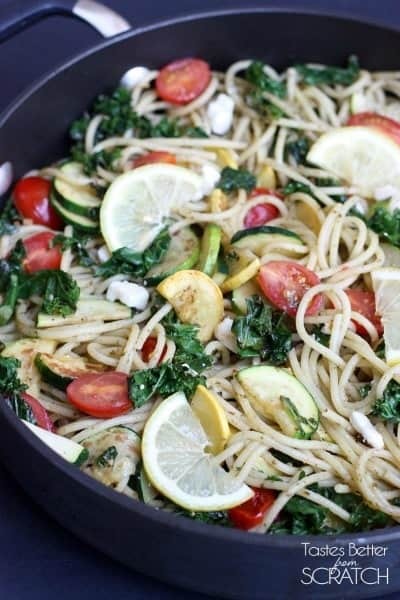 Lemon Pesto Pasta is a fresh and healthy pasta dish with spaghetti noodles with cherry tomatoes, zucchini, squash, kale, pesto, cheese, and lemon. You entire family will love this fun and flavor chicken wrap. 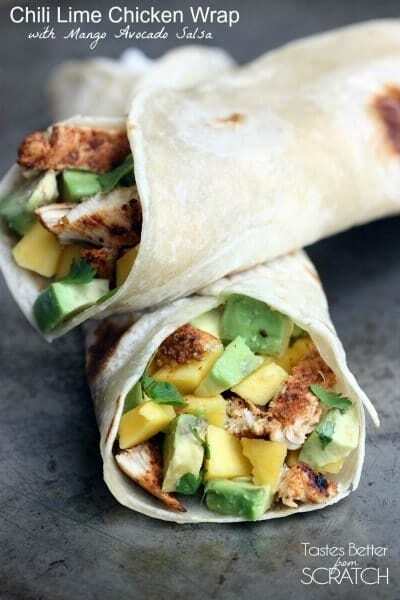 It includes blacked Chili Lime Chicken topped with a fresh mango avocado salsa and served in a cheesy tortilla. I serve it with rice pilaf, for a complete meal. 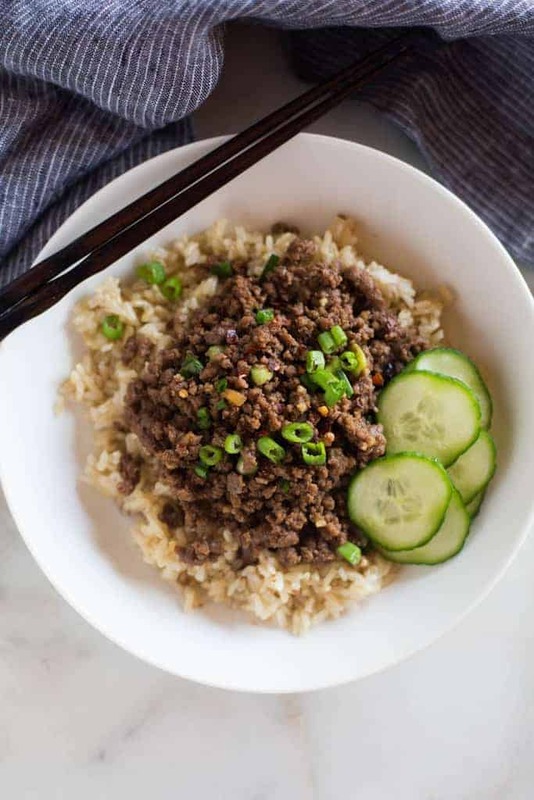 I love to mix up our dinner rotation with these quick and easy Korean Ground Beef Bowls. The flavor combination is fantastic with the perfect blend of sweet and spicy Korean BBQ flavor in the meat, served over hot cooked brown rice, with a side of fresh sliced cucumbers. 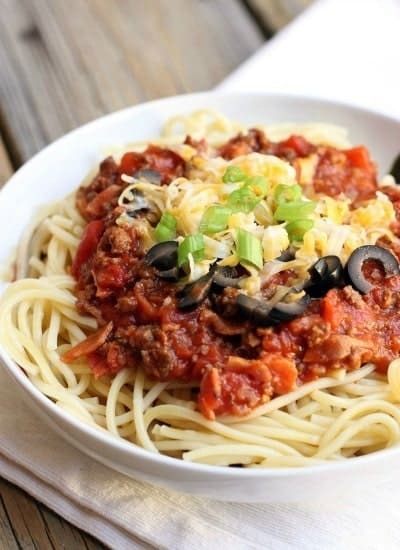 Cowboy Spaghetti is a delicious, smokey twist to traditional Spaghetti. It’s so flavorful and filling, and even my pickiest eaters love it! 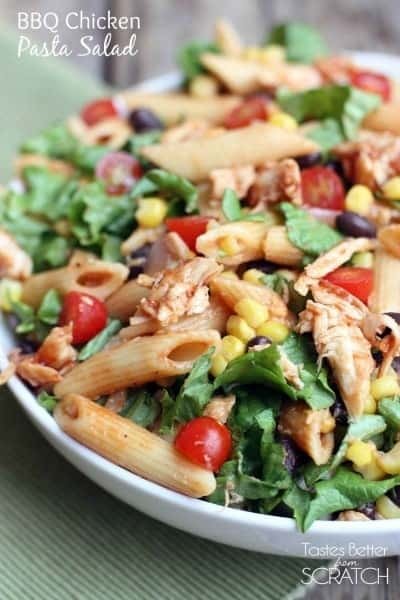 This hearty BBQ Chicken Pasta Salad is perfect for a quick dinner and includes penne pasta, black beans, corn, tomatoes, and cheese over a bed of green lettuce. 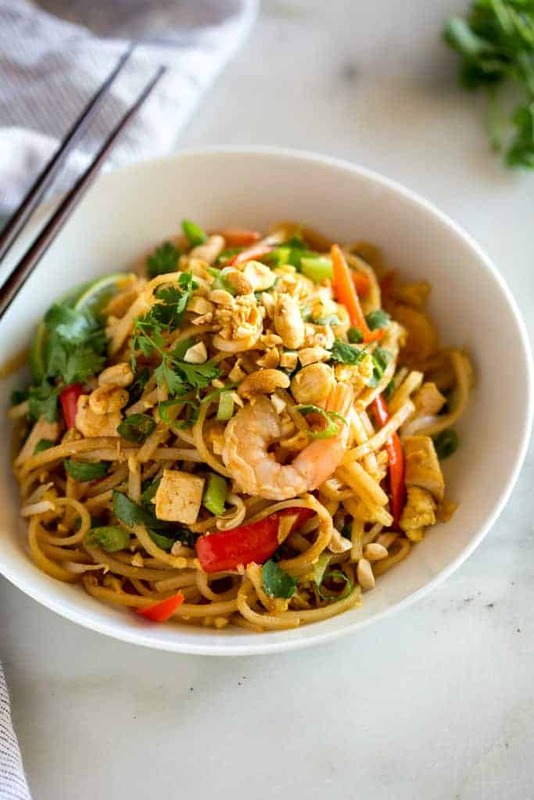 This delicious Thai dish is bursting with flavors and you wont believe how easy it is to make! I typically serve it with white or brown rice. 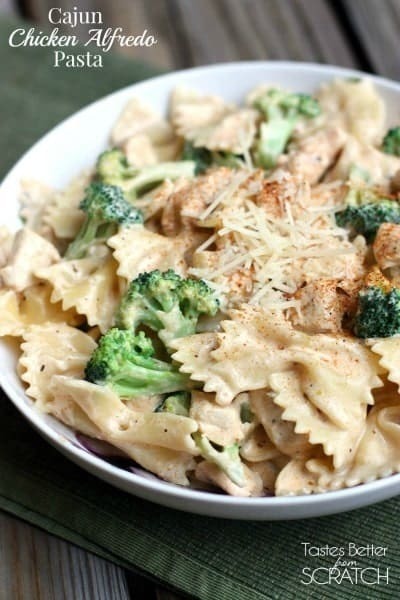 Cajun Chicken Alfredo Pasta is an easy pasta dish with chicken, broccoli, and parmesan cheese served over your favorite type of pasta. 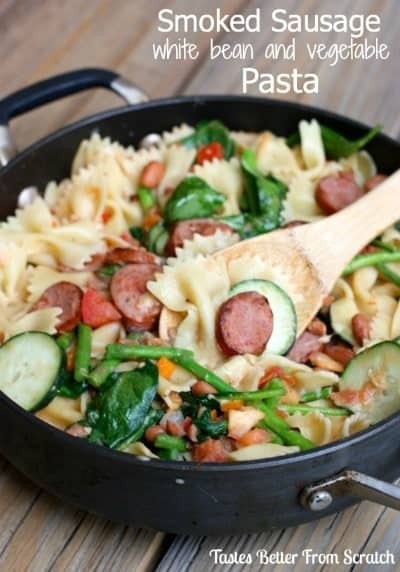 If you’re looking for a healthy but filling and flavorful dish for dinner, this pasta is simply delicious. It includes spinach, bell peppers, zucchini and asparagus is packed with protein. This looks like the best practical list I’ve ever seen! Thanks!